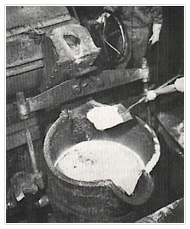 High temperature performance of expanded Perlite insulation has been well documented over a period of many years. Although thermal conductivity increases appreciably above 980°C, expanded Perlite has been used at service temperatures as high as 1100°C. Perlite insulation is used in high temperature applications in the steel and foundry industries such as ladle topping, hot topping and rise ring, in topping compounds, in exothermic and insulating shapes, as a cushioning agent, in molding sand and in the manufacture of refractory blocks and bricks. In ladle topping applications, expanded or un-expanded granular ore forms of perlite are added to molten metal pouring ladles. 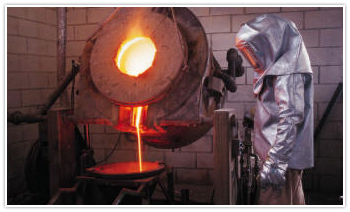 Most often the ore form is used which reacts with slag in the ladle to allow easy removal of the slag layer. In cases where it is desirable to maintain a metal temperature in a ladle, the expanded perlite layer forms an efficient insulating blanket. When perlite is introduced during ladle filling, a gentle rolling motion is produced which cleanses the metal by coagulating impurities. In addition, ladle-lining life is increased by virtue of a vitreous residual coating left on the refractory by the perlite. An added advantage of perlite in this application is that no objectionable smoke or noxious fumes are produced. Perlite is often mixed with exothermic powders and used in hot tops and risers to prevent shrinkage cavities in ingots and castings. Perlite is the most commonly used lightweight filler used for these applications because of its availability, cost and superior properties. Normal additions of perlite to insulating and exothermic compounds are in the range of 3 to 20% by weight. Formed shapes are often employed which take the form of hollow cylindrical sleeves for risers and panels for hot tops. These shapes perform essentially the same function as hot topping and risering powders and compounds. Perlite is used in the manufacture of refractories where the average temperature does not exceed approximately 1 100Â°C. Because of its excellent insulating properties, there is substantial usage of perlite in refractory castables, bricks and blocks. In higher temperature applications, perlite refractories are often used as back-up insulating layers for higher duty refractories. Perlite is added to foundry core and molding sand mixtures as a cushioning agent to compensate for the expansion of crystalline silica as it goes through phase changes at temperatures in excess of 540Â°C. Casting defects such as buckles, veining, fissuring and penetration are minimized and cleaning room costs are reduced. In addition, perlite improves permeability of core sands thus reducing defects attributable to poor venting. Perlite in ladle topping applications allows easy removal of slag and helps maintain the temperature of the molten metal in the ladle.